We’ve released a CCTV image of two men we’d like to speak to in connection with a knifepoint robbery in Epsom. 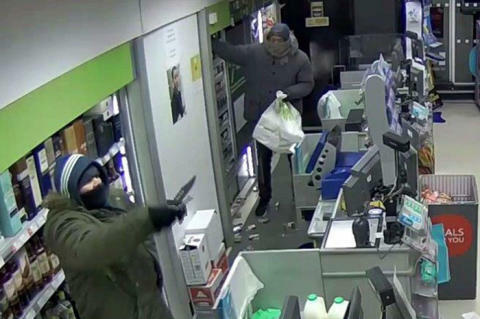 Two men wearing balaclavas went to the Co-op in Tattenham Corner just before 10pm on 21 January and threatened staff with a knife before taking a significant amount of cash and a large quantity of cigarettes. One of the men is described as white, aged 20-30 years and spoke with a London accent. He was wearing a dark green hooded jacket, a navy blue hooded top with white trim and the hood up, a black scarf across his face, dark green tracksuit bottoms, black trainers and black gloves. The second man is described as black, aged 20-30 years with a London accent, and was wearing a dark grey jacket with a fur-lined hood, a navy blue hooded top, dark jeans and black trainers with a white sole. He was also carrying a bag. We’re keen to speak to the men pictured as they may have information about the incident. We would also like to speak to someone who may have seen the suspects before they entered the shop. He is described as a man aged around 50 years, with black and grey hair. He was wearing a white shirt and a blue parka style jacket with an orange lining and a fur-lined hood, and was carrying a green carrier bag. Anyone with information should contact Surrey Police on 101 (999 in an emergency) or http://surrey.police.uk/TellUsMore , quoting reference PR/45190007445.